Cornwallis statue covered in a tarp. On January 30th 2018, Halifax Regional Council voted 12-4 in favour of the immediate removal of the statue of Edward Cornwallis which has stood upon a plinth in the city’s south end since 1931. Despite the oft-repeated lamentations from colleagues and constituents about the “rewriting of history,” 12 councillors finally found the courage to listen to both prominent Mi’kmaq activists and the wider population, bringing an end to a drawn-out controversial process marked by racism and vitriol. 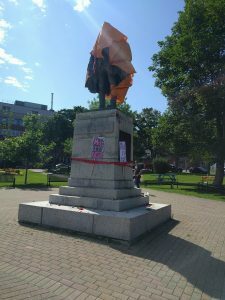 Within 24 hours of the vote, Edward Cornwallis was removed from his pedestal and sent off to a warehouse to await Council’s next step, whether that be relocating the statue to a museum or leaving it to gather dust in a storage facility. The removal of the statue caps a process which began 25 years ago with the publication of We Were Not the Savages by Mi’kmaq Elder Daniel N. Paul. Paul’s book revealed the unsavory history of Edward Cornwallis to a wide audience, laying bare the brutality with which the first Governor of Halifax transformed Mi’kma’ki into the British space of Nova Scotia. As revealed by Paul, Cornwallis issued a bounty for the scalps of “the savages commonly known as Mickmacks [sic]” to wipe them from Nova Scotia entirely. Paul’s work and activism launched a public discussion about Cornwallis which has ebbed and flowed periodically since 1993. In 2011, Edward Cornwallis Junior High School was renamed to the uncontroversial (if admittedly boring) Halifax Central Junior High, largely due to Paul’s work. In May 2016, however, a Halifax Regional Council motion to discuss removing the statue (not to remove the statue, but to discuss it) was voted down 8-7 after a tense debate. 11 months later, the words of Halifax’s poet laureate Rebecca Thomas inspired the reintroduction of Cornwallis to municipal debate, and council shortly thereafter agreed, 15-1, to form a panel to discuss the statue (again, discuss. No commitment on removal). 9 months later, and the statue has been removed. After years of baby steps, political action on Cornwallis has rapidly accelerated in the past year, pushed along by a surge in activism. Much of the conversation has focused around the nitty-gritty details of Nova Scotian history – Paul’s work, along with Jon Tattrie’s biography Cornwallis: The Violent Birth of Halifax, expertly laid out the historical case to stop our public commemoration of Edward Cornwallis. In my view, however, what is more compelling than the study of Cornwallis (who Saint Mary’s University historian John G. Reid refers to as “not a particularly significant historical figure”) is the study of the statue itself – how Cornwallis came to be commemorated in Halifax. For well over a century following his 1752 departure from Halifax, Cornwallis was largely forgotten in Halifax, save the north end street which bore his name. That Cornwallis didn’t leave a major commemorative imprint is frankly unsurprising, considering his tenure; Reid has noted that Cornwallis was a largely unsuccessful governor, and, amusingly, Cornwallis spent his three years in Halifax asking his superiors at the Board of Trade to relocate him from Nova Scotia. Not exactly the kind of patriotic Nova Scotian who one would expect to be lionized, especially considering Nova Scotia’s proud connection to the Scots, who Cornwallis loathed deeply and massacred on the fields of Culloden during the Highland Clearances. Even looking beyond his brutal treatment of the Mi’kmaq, there seems to be no compelling reason why Cornwallis should have ever been considered a great hero of Halifax. And yet, he has been. J. Massey Rhind’s sculpture was installed in June 1931, but its history goes back three decades to the metaphorical resurrection of Cornwallis as a historical figure in 1899. In Halifax’s sesquicentennial year, a biographical paper on Cornwallis was published by the Royal Nova Scotia Historical Society, kickstarting a process in hero-manufacturing that yielded the installation of the statue in 1931. The statue, now in an undisclosed storage facility à la Ark of the Covenant at the end of Raiders, is itself a fascinating historical artifact, a material encapsulation of the British imperialist strain of Canadian nationalism that fueled its creation, the same nationalism which caused everyday Canadians to respond with shock and rage to calls for the statue’s removal. In January, Halifax Mayor Mike Savage poetically stated that the history of Halifax is not “cast in bronze,” and, indeed, it is not. What is “cast in bronze,” however, is the material history of Cornwallis’s statue. It is in this context of Canadian nationalism that Edward Cornwallis was dusted off, transformed from “the guy who was the administrator when the city was founded” into an example of imperial glory. He was a natural pick to inspire imperial devotion; by founding Halifax, he had established a British foothold in North America, facilitating the settlement of the space beyond. Cornwallis, thus, was elevated to the manufactured position of ‘founder of Halifax’ – a role specifically invented for this sort of hero-making – and the campaign to erect a statue of him began in the 1920s. The installation of a statue honouring a great figure like Cornwallis, it was thought, would instill a sense of imperial pride and identity in a younger generation of Nova Scotians – this thought lay at the heart of the Cornwallis statue project. The imperialist impetus for the statue is heavily conveyed in photos of the unveiling ceremony: thousands gathered to see the revealing of the statue, which was draped majestically in a Union Jack, one of many British ensigns flying in the park that day. Hand clutching his sword, looking east towards Great Britain, Edward Cornwallis truly looked the part of triumphant imperialist and great Nova Scotian. The contemporary defenses of Cornwallis have been shaped in the language and materials of that British imperial mythos. In a 2011 Chronicle Herald op-ed, columnist Paul W. Bennett derided Paul’s account (condescendingly referring to it as a “tale”) defending Cornwallis as “brutal but effective.” To David Hendsbee, the most vocal Cornwallis-defender on Halifax Regional Council, removing the statue would be “disrespectful to the history of Halifax itself;” when questioned why he supports the maintenance of the statue, Hendsbee reaffirms the significance of the ‘founder of Halifax.’ Both indigenous and settler activists who demanded the statue’s removal were described by Hendsbee as being “on the warpath.” Similarly, Hendsbee’s fellow councillor Matt Whitman, in his defense of Cornwallis, retweeted a pro-Canadian identity, anti-indigenous group which was lamenting the statue’s removal. This language – the acceptance of Cornwallis as the ‘founder,’ the praise of his effectiveness in facilitating settlement, the emphasis on Canadian identity – is a demonstration of the statue’s success; the aim was to create a national hero, a focal point for our collective historical memory. Mission accomplished. 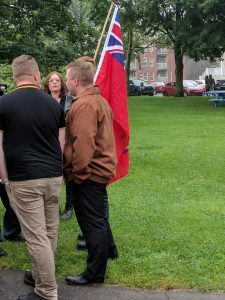 The currency of imperialist nationalism, milder in Hendsbee and Bennett’s articulations, is laid painfully bare in the conduct and get-up of the “Proud Boys,” members of a far-right “European chauvinist” organization (and, significantly, also members of the Royal Canadian Navy) who crashed a protest at the statue on Canada Day 2017. Responding to a protest they had heard was disrespecting Canada and Cornwallis, the “Proud Boys” emphasized Halifax’s British identity, repeating that Canada is a “British colony.” While defending Cornwallis – who the Proud Boys organization proceeded to name its ‘Proud Boy of the Week,’ after the organization’s founder Gavin McInnes appeared on CBC’s Power and Politics defending the scalp bounty – the five navy men waved the Red Ensign, the flag of imperial Canada, the banner of the British tradition in Canada’s national material culture. Just like many Canadian nationalists of the old imperial mode did in 1965, the “Proud Boys” even lamented the switch from the Red Ensign to the current Canadian flag, derisively (and incorrectly) slamming Pierre Trudeau for his betrayal of the empire. Central to the “Proud Boys” defense of the statue and Cornwallis (not to mention their disdain for Mi’kmaq protesters) was the foundational belief that Halifax is in its essence a British space, and to be Canadian – to celebrate Canada Day – is to celebrate the empire. The nationalism which built the statue drives its defense – although slightly more niche, the imperialist strain of Canadian nationalism lives on in 2018. Protest Summer 2017. Photograph by author. It is no coincidence that the defense of the statue in the 21st century has been based in invocations of the same sense of Anglo-imperial nationalism that led to its initial construction. For those who have grown up immersed in the ideology of the empire, criticism of Edward Cornwallis is perceived to be a direct onslaught on their national sense of self. The reassessment of Cornwallis threatens the understanding of Canadian history and identity that has been accepted as default – the understanding that Canada is, at its core, a British space. The Cornwallis statue helped secure and consolidate a narrative of Canadian history based around the triumph of settlement and conquest, a narrative which celebrates the spread of the British Empire through North America. Until We Were Not the Savages, Cornwallis as ‘founder’ was a fact of life, his statue uncontroversial. It’s important that we reckon with the role public heritage projects have played in the consolidation of this sense of imperialist nationalism. Canada’s bloody, violent settler colonial history has been and continues to be actively celebrated in our historical monuments – Cornwallis is but one of many. The Canadian historical memory created by heritage projects like these, those which have consolidated our imperial sense of self, needs to be reconsidered. Going forward from here, how can Canadian Heritage and other creators of public memory create new narratives of Canadian history? The removal of Edward Cornwallis does not vanquish the attitudes it represents, but it serves as a significant symbol of our rejection of the imperialist strain in Canadian nationalism it was commissioned to champion. It is the role of our educational systems and our heritage projects to continue this progress. The easiest antidote to our triumphalist nationalism is a baseline understanding of the horrors wrought by settler colonialism. Heritage projects created nationalist mentalities – they also have the power to undo them. In conversation with me in June, Daniel Paul, now 79, expressed his uncertainty that he’d live long enough to see the statue removed. Last month, he did. A few days after the statue’s removal, Daniel Paul stood where Cornwallis’s pedestal used to. The removal of the statue is a victory for Halifax – let’s continue Paul’s work. We Were Not the Savages – Daniel N. Paul, 1993. Cornwallis: The Violent Birth of Halifax – Jon Tattrie, 2013. “The Three Lives of Edward Cornwallis” – John Reid, 2013. Tom Fraser is a Nova Scotian expat in Toronto, born and raised in Halifax/K’jipuktuk, and a Research Fellow at the Northrop Frye Centre at Victoria College in the University of Toronto. In 2017, he co-produced the documentary “Indefensible: The Troubling Legacy of Edward Cornwallis,” upon which this article is based (https://youtu.be/5czbjc4iVMA). You can find him at @tomfraserhfx on Twitter and contact him at thomas.fraser@mail.utoronto.ca.